I can’t be absolutely anything I want to be, and neither can you. At least, not to any degree of meaningful quality or effectiveness. It all depends on your natural pool of talents. I simply don’t have the natural talents to be an all-star basketball player. I have bad hand-eye coordination when it comes to throwing and catching, I’m not fast, and I’m short. Could I, if I really, really worked at it, become passable at basketball? Probably. Could I ever be really great? It’s extremely unlikely – I would hazard to say impossible. I don’t have the right natural talents. A very good place to start in developing our own or other’s talents is to ask what natural talents exist. We may not – in fact probably won’t – be aware of all of them right from the start. Some natural talents only emerge when we put our hand to something new. But nevertheless, identifying those natural talents that we can see is a great starting point of development. Do you have a natural ability with words; with people; with colours? Do you find it comes naturally to think strategically; identify patterns; take things apart and put them back together? Once you’ve identified a natural talent, the next step is to turn it into a skill. 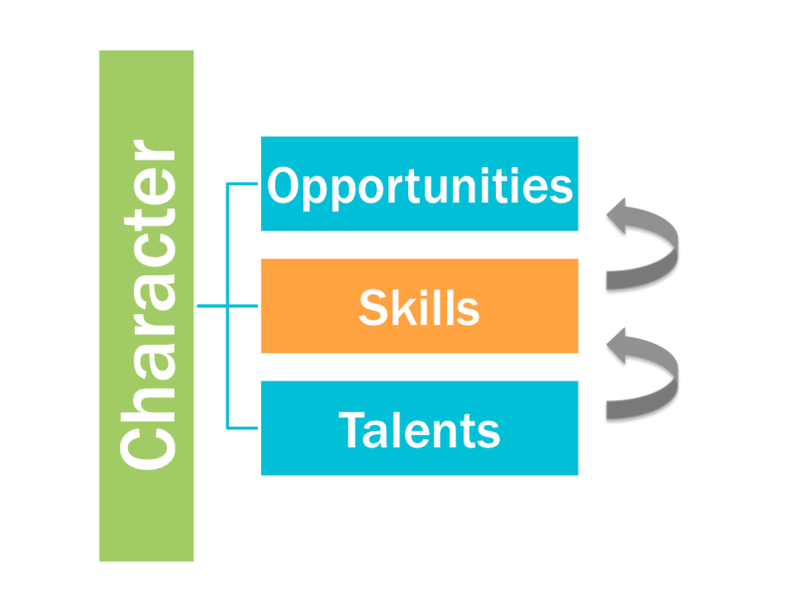 Skills are talents that have been honed and developed so they are fit for purpose and effective in the world. Learn the theory and context of that skill area. This could look like a training course, like university, like checking out blogs and books in that area of expertise. This lets you learn from lots of other people who’ve come before you, and will let you develop a lot more quickly than having to learn it all the hard way by trying and failing from the ground up. Practice, practice, practice. Get out there with your camera and take a million photos. Write a hundred articles that might never be read by more than five people. Learn to code a game, a website, an app. Just do, make mistakes, learn from them, and try to do it better the next time. Get around people who have already developed that skill. Watch them. Ask questions. Offer to assist. Find people you can learn from, whether it’s in real life, or as ‘virtual mentors’ through their printed or online presence. Once a talent has been honed into a skill, the next stage of development comes through opportunities to put them into practice in a new, bigger or more complex way. How could you, or the person you’re looking to develop, get access to a new opportunity to develop their skill area? Volunteering can be an invaluable way to gain experience and get access to the opportunity to develop your skills further. I have learnt extremely valuable lessons in project management, leadership, conflict resolution, public speaking, creativity and time management from volunteer opportunities. What could you put your hand up for or lean into at work that would provide an opportunity to develop your skills further? What could you invite the person you’re looking to develop to be part of? Is there a time-bound project or task force that could provide a great opportunity? Is there something that needs to be done but no-one has managed to get to, which could be a great space for growth and contribute to the team at the same time? Sometimes you have to create your own opportunities. Can you start something of your own that will be its own opportunity for development? Ask yourself how your area of skill can be turned into something that invites others in by creating something of value to share, sell, contribute to or engage with. Here’s the crunch point in all of this – character. 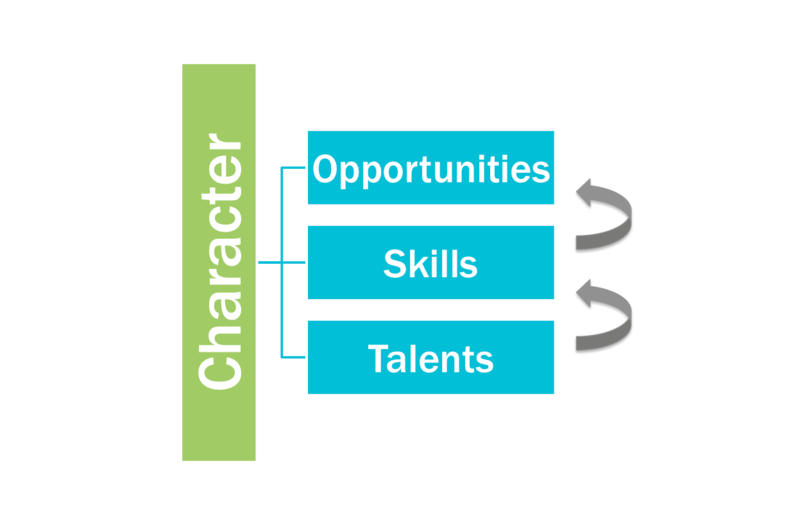 As much as we develop our talents into skills and develop our skills through opportunity, character is the defining element that surrounds it all. This goes for those we are entrusting responsibilities to as well. Character is the lid. If you want to live a healthy, ethical life that leaves a positive impact on the world and those around you, you can’t get ahead of your character. We can only take on demands, responsibilities and profile to the extend that our character is developed enough to keep us connected to the principles and disciplines by which we seek to live life. Anything else is a problem waiting to happen, and the larger our influence, the more people will be affected by it. 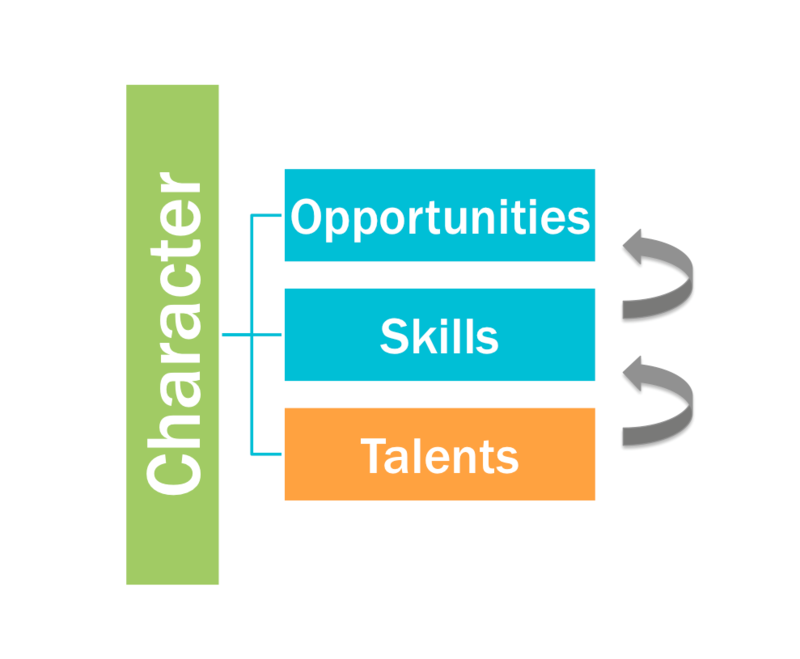 That’s why we have to be more attentive to the development of our character than any talent – it determines the area in which the potential of our talents can operate. As I’ve written before, character is make or break, and that should influence the way we deliberately work on it. So where are you with your own development? With the development of those you’re leading? 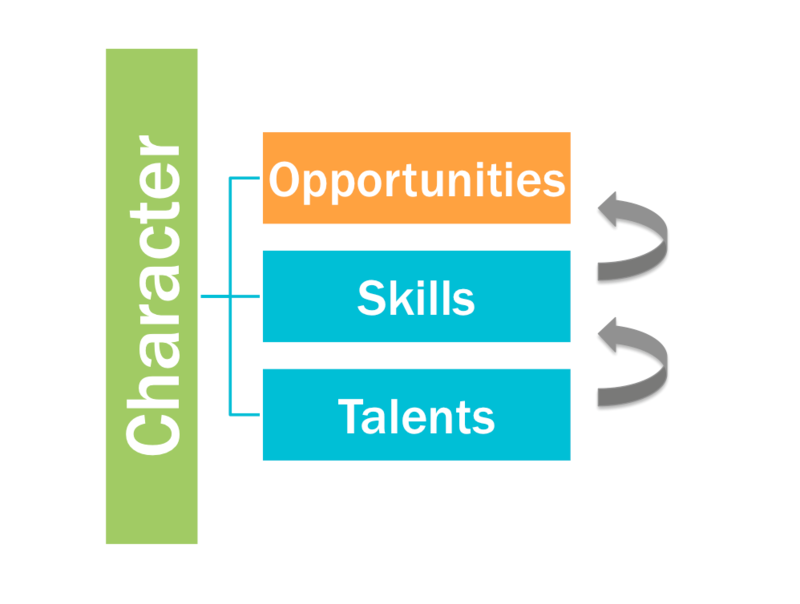 How could you help develop a talent into a skill, or release a skill through an opportunity? 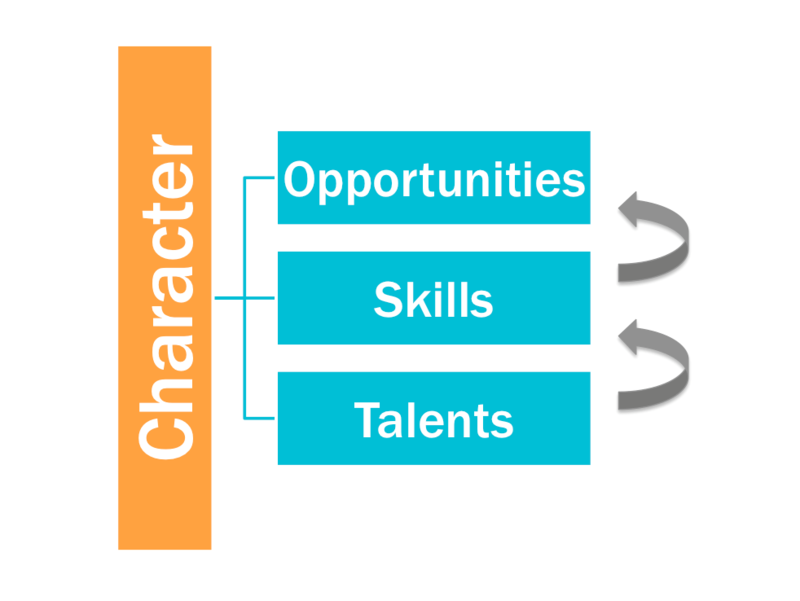 What are the critical areas of character you need to make sure you develop over the next 12 months?